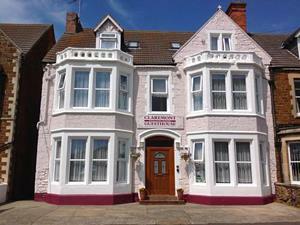 Claremont Guesthouse01485 533171work Guest AccommodationClaremont guesthouse is located in Hunstanton. There is free Wi-Fi access available and there is free on-site parking. Each room here will provide you with a TV and tea/coffee making facilities. Featuring a bath or a shower, the bathrooms come with free toiletries. Some rooms boast a sea view. Other facilities offered at the property include a breakfast room and a shared guest lounge with a flat screen TV. The property is a 4 minute walk to the amusements and arcades and an 11 minute walk to the Hunstanton Sea Life Sanctuary. Claremont guesthouse is located in Hunstanton. There is free Wi-Fi access available and there is free on-site parking. Cycle storage available. 500 metres from sea front and amusements. Children welcome from age 5. Off A149 turn left at Greevegate, opposite recreation ground, house is 300 meters on right before St Edmunds Church.